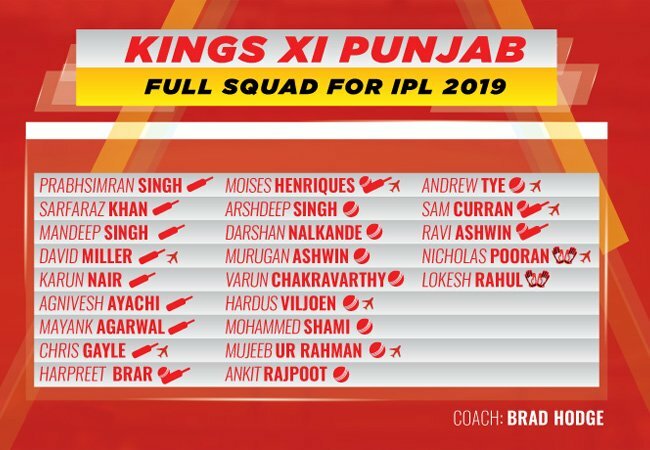 Kings XI Punjab Predicted Playing XI: CrickeX presents before you Kings XI Punjab’s playing XI forIPL 2019. One of the three franchises to have not won an Indian Premier Leaguetitle despite playing each season since its start in 2008, Kings XI Punjab would be desperately wanting to set the record straight this time round. In 2014, Punjab had come close but couldn’t go past Kolkata Knight Riders in the final. While that remains their best season performance till date, even it had happened half-a-decade ago. Apart from not winning title, the franchise from the Northern most part of the country usually finishes in the bottom four, which further increases their misery. This year’s IPL auctions saw Kings XI laying hands on perhaps the most raw talent in the country. From spending a colossal INR 8.4 crore on a mystery spinner doing the rounds across the nation to buying an 18-year old local wicket-keeper batsman for INR 4.8 crore, the auction witnessed Kings XI making some brave decisions. While they must have received some flak for the same from their fans, you never know if these unknown names do what some of the best in the business couldn’t do for Punjab in the last 12 years. While the opening pair of Chris Gayle and Lokesh Rahul yielded fruits for Punjab last year, the batsmen who followed couldn’t capitalize on the start provided by their openers.While Gayle had scored 368 runs in 11 matches at an average of 40.88 and a strike rate of 146.03, Rahul had rocketed his way to 659 runs in 14 matches at an average of 54.91 and a strike rate of 158.41. It is worth mentioning that both of them have been low on recent form. While Rahul has struggled at the highest level in the recent times, Gayle has scored 203 runs in 12 matches at an average of 18.45 and a strike rate of 106.84 in the ongoing Bangladesh Premier League. Currently representing India A against England Lions at Wayanad, Rahul ended Day 2 at 88*. On the other hand, Gayle was recalled into Windies’ ODI squad for England series yesterday. Kings XI Punjab would be hoping for both of them to strike form before the 12th season of the IPL. Mayank Agarwal, who made a successful Test debut against Australia in December, would be looking to carry forward the momentum into the T20 competition for he was one of the batsmen who had misfired for KXIP last season. Much like his Karnataka teammate Rahul, Karun Nair has also been out of form recently. The 27-year old right-hand batsman, who remained Kings XI’s third-highest run-scorer last season, would be looking to make a significant impact this season. Given his experience of not just a player but as a captain as well, Australia all-rounder Moises Henriques is expected to play a key role at Kings XI Punjab. The 32-year old cricketer would be expected to stand tall in both the batting and bowling departments. Apart from leading the side and deceiving the opposition batsmen, Ravichandran Ashwin will also have to make an impact with the bat in hand. Given the structure of Kings XI’s squad, one expects him to bat at No. 7 for a considerable part of the season. With 24 wickets in 14 matches at an average of 18.66, an economy rate of 8 and a strike rate of 14, Andrew Tye was the highest wicket-taker in IPL 2018. With Tye leading the fast bowling department, one out of Mohammed Shami or Ankit Rajpoot will share the new ball with him. Given Rajpoot had impressed one and all last season and Shami has a dismal record in the tournament, one expects the former to win this race.